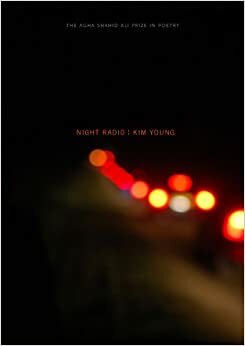 In Kim Young's debut collection, Night Radio, Young sets forth a collection that reads as a grainy 8mm home video, with a close-up of the father, of the sister. "Imagine this as footage, timed and without sound," the epigraph reads. Yet, Night Radio does not capture the typical home movie birthday parties and barbecues. Young focuses instead on those occasions many long to forget: floods and earthquakes, with the abduction of the speaker's sister as the catalyst for the collection. Young pieces the speaker's memories of her sister's abduction together as home movies and memories often are: haphazard and fragmented. The speaker attempts to find solace by recollecting the past, but when memory fails her, recollection becomes recreation. Night Radio consists of forty-one poems split into three sections: "What We Count On," "The Parting," and "Latchkey." The poems are arranged nonlinearly, and information presented oftentimes reads as confusing until several poems later. In the opening poem, "Too Much Text," the speaker states, "let's begin with the window again," but it is not until "The Parting," over twenty pages later, that the reader realizes this window refers to the window that the speaker's sister snuck out of on the night of her abduction. Many times throughout the collection, there is mention of a crime or abduction with no connection to the speaker or her sister, leaving the reader to wonder if this is the same event. In "The Facts," Young writes of a female teenager who is abducted and given two quarters when she is released from the kidnapper's car. This female remains unconnected to the speaker's sister until "At Rehab" when it is revealed that this change is one of the few memories her sister has of the abduction. Such a lack of chronology makes the reader question the preceding information, but it also creates a sense of fulfillment when the reader discovers the connection. Young places the reader in the role of detective as the reader attempts to parse through these varying accounts, necessitating multiple reads as his memory is often tested. As the reader's memory is challenged, so too is the speaker's. In the opening poem, "Too Much Text," the speaker states "I lose each small thing. / This is important. I am not a child, and I remember everything." Yet, since the abduction occurs when the speaker is a child, the reader is made to doubt the speaker's ability to accurately recall the event. Tested memory is seen again when the speaker corrects her account in "Matching Terry Sweatsuits": "there is a man in a hood / an Iranian man, / no the neighbor, no the day workers, at the door." Young continues to play with memory throughout Night Radio. As the widow in "The Fabric of Afternoon" is reminded of her husband when she "turns the ring on her hand," with each remembrance there is an attempt to reconcile. In "Too Much Text," the speaker states, "We live with the blues / and then tell stories so we have reasons." There is catharsis in telling. This theme runs throughout the work: "It's my turn to tell this story" in "Abduction," "I remake it over and over again" in "Was it Beautiful?," "They clung / to their tools and their stories" in "The Myths," and "Whatever's / concealed, whatever doesn't fit, / stays quiet and cold" in "Winter." Despite the catharsis of disclosure, the speaker still longs to recreate the past. She has been afforded hindsight, has replayed the events over and over again, and understandably wants to rewrite them. Individually, these poems resemble blurry polaroids and with reason: many of the poems are incomplete memories at best and are reliant upon contextualization. Each poem builds upon another. They are individual frames that come together for the final movie. With each added piece, the timeline of events becomes more clear, and the camera steadies. It is this building on of poems and memories where Young's collection is most effective. Only in its entirety does the book become footage. With each additional poem, the memory of the speaker is recreated, and the reader is forced to reevaluate his own reading and alter his own recollection in accordance with the speaker's. The reader is made to doubt his memory in the same way the speaker doubts hers. Night Radio reads like memories long repressed slowly creeping back into the comprehension of a trauma victim. Young has written a book of abduction, yes, but this is also a book that calls for recreation of the past and reclamation of one's own voice. Young forces the reader to question the reliability and necessity of memory: what we wish to remember, what we try to repress, and what we know we must not forget. Lori Mosley is from New Orleans. She currently lives and teaches in southwest Louisiana where she works for the literary journal Ostrich Review. Her poems are out or forthcoming in The Greensboro Review, The Minnesota Review, and The Pinch, among others.